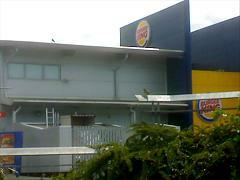 Burger King Forestside is found in Drumkeen Retail Park. Has a drive-through. Have you got Google Earth on your computer? If so, then download the Google Earth Map of Burger King Forestside. Is this the wrong position for Burger King Forestside? If you think so, then modify its position. The staff at this franchise are always very pleasant and helpful, often going out of their way to help me to my seat with my meal or ensuring there is no salt added to my chips. The food is always fresh and hot and presented neatly on the tray. Their recent renovation of the restaurant is very pleasing and inviting. However, the management leaves much to be desired, i have witnessed arguments between the managers and customers and have witnessed nasty comments being exchanged. I have also felt like i am being rushed when placing my order with certain individuals. overall i am happy to eat here regularly, the food is lovely and within my price range and I'm (usually) greeted warmly by staff. I found the customer service very good, the seating area was exceptionally clean with staff continually washing down seating areas, tables and clearing away left over food which some people don't seem to realise that the bin is located within the restaurant for that purpose! Will be back. I come here now and again and the food is usually to a good standard, staff are friendly, the restaurant is kept clean as are the toilets. The service is what you would expect from a fast food joint where the staff are making minimum wage or thereabouts. They still stock vanilla milkshakes which is nice. It's much better than the Burger king in the city centre which appears to be very badly managed. If the previous comment is to believed and the drive thru is bad then I would advise drivers to get off the lazy back sides and order inside (hardly rocket science). Spanner! have eaten at this burger king many times and have found the food and the service to be excellent. the restaurant is kept clean to a high standard and the staff are pleasant and very helpful. i would recommend this restaurant to anyone and will continue to use this particular venue whenever i am in the area.